Rick Perry on Trump Endorsement: "We Let Bygones be Bygones"
In Austin, former Gov. Rick Perry on Friday defended his endorsement of Donald Trump, the presumptive Republican presidential nominee whom Perry once called a "cancer on conservatism." Perry said such rhetoric comes in the heat of battle. Former Gov. Rick Perry on Friday defended his endorsement of Donald Trump, the presumptive Republican presidential nominee whom Perry once called a "cancer on conservatism." Speaking with reporters in Austin, Perry said his previous remarks assailing Trump were part of a heated process that ultimately leads to the Republican Party unifying behind its nominee. "We are competitors, and so the rhetoric is in the heat of battle. It's in the chaos of a presidential bid," Perry said, also noting his criticism of Mitt Romney during the 2012 presidential campaign. "If no one doesn't understand that, then they don't understand how our process of elections work. We compete, and then we let bygones by bygones." Perry also acknowledged he was respecting the will of the voters, saying the nominating process has led to Trump. "There seems to me to be comfort with Donald Trump in the Republican Party at this point in time," Perry said. A day earlier, Perry enthusiastically endorsed Trump in an interview with CNN, a remarkable about-face for a former candidate who was the first in the GOP field to sound the alarm about the billionaire's candidacy. After dropping out, Perry went on to endorse U.S. Sen. Ted Cruz of Texas, whose exit from the race Tuesday set in motion Trump's rise to presumptive nominee. Asked whether he'd advise Cruz to support Trump, Perry replied that Cruz "has the intellect and the character to make the right decision on his timetable." "I think anybody who's ever been through one of these things before, there's a little bit of raw feelings," Perry said. "It takes just a little bit of time to get over some of it, and I certainly am willing and Donald Trump is willing to give those competitors the time to think this through, but at the end of the day, we're going to support the Republican nominee." In his interview with CNN, Perry expressed some openness to serving as Trump's running mate. He did so again Friday, not ruling out the possibility. "I will entertain helping my country," Perry said. "I have no idea what that might detail, what that form may be in." 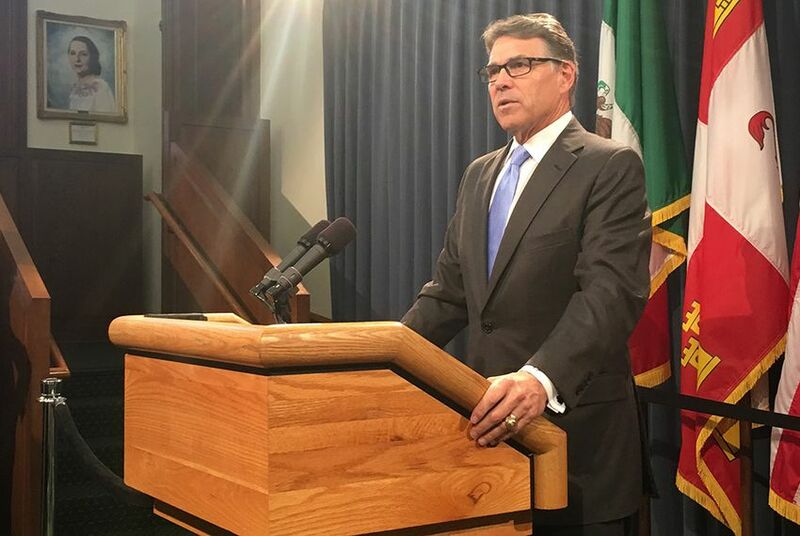 Perry spoke with reporters following the unveiling of his official portrait Friday morning at the Texas Capitol. Earlier Friday morning, Trump thanked Perry on Twitter for his endorsement, which called Trump "one of the most talented people who has ever run for the president I have ever seen." Despite the praise, Perry told reporters it has been a while since he has checked in with his former rival. "We haven't had a conversation in probably six months," Perry said.